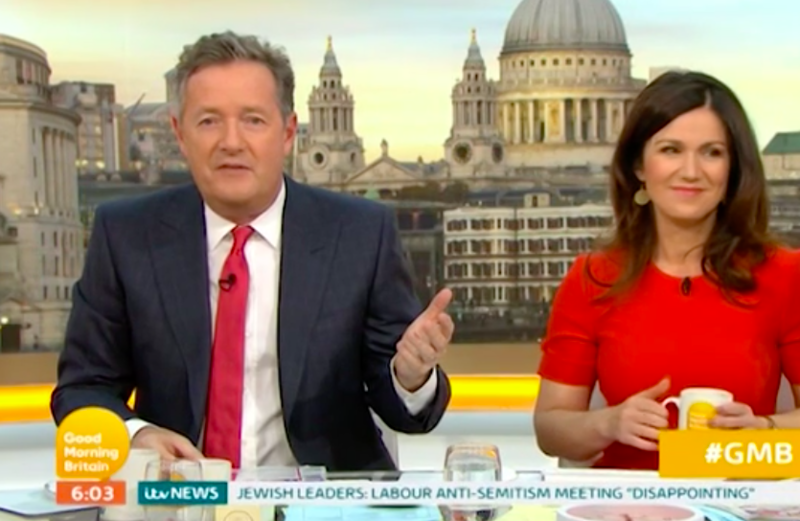 Piers Morgan just set the record for swearing at the earliest point on live TV and wow is it awkward. The 52-year-old Good Morning Britain presenter woke the world up Wednesday (April 25) with a rather #naughty spot of language. In a pseudo-heated exchange with weatherman Alex Beresford, Morgan accidentally let slip an expletive. Co-host Susanna Reid had been describing how Alex had been ‘whimpering’ outside the ITV Studio doors when he arrived earlier that morning. Who are you? I’m TV’s Alex Beresford. I came in f**king fifth in the dance show on ice. Beresford replied: “Oh, for crying out loud,” as Piers attempted to carry on with the show but the atmosphere was hella stifled. @GMB did I hear right Piers swearing on national TV the F bomb was dropped ????????? It just goes from bad to worse for the presenter. Last month he appeared genuinely ruffled when Lior Suchard announced the first two digits of Piers’ PIN – three and nine if you are interested – live on air. Shocked co-host Susanna Reid quickly advised the outspoken presenter to change his pin code asap, with Lior jesting he would be using the bank details. Reid was also bamboozled by the psychic, despite doing her upmost to hide her thoughts. Not only did Lior guess she was thinking about a cat, he had posted a piccy of a cat to Instagram an hour before; so confident had he been about the inner workings of Susanna Reid. Then, as if 2018 is completely out to get him, Morgan fell victim to a lewd cartoon depicting him brown-nosing President Donald Trump. The image was broadcast on BBC Two programme The Mash Report, during a segment by comedian Rachel Parris who was talking about the recent interview between Morgan and the US president. Morgan took to Twitter to express feelings towards the image, posting it three times in the process, questioning how it would have been received if it were a female journalist and UK Prime Minister Theresa May. So not a fantastic four months for the big lad.